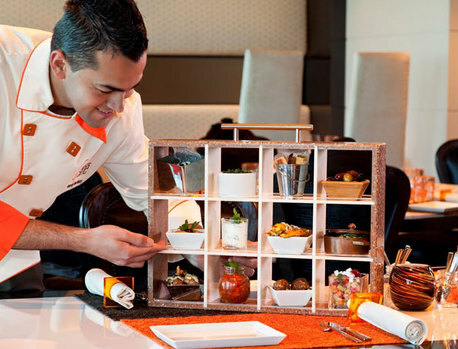 Celebrity Cruises are determined to gain wider recognition for the food on their ships. To the extent that chief executive Michael Bayley has plans up his sleeve to open a New York restaurant serving dishes from the menus in an attempt to earn Michelin star status. London’s own Celebrity pop-up food and drink outlet opens today in Regents Park. The company is operating a stand at the Taste of London festival; visitors will be able to sample popular items from the quirky Qsine restaurant menu and executive chefs will be on hand to showcase skills such as sushi lollipop. Celebrity will also offer festival-goers the chance to browse on-board menus and wine tasting notes in the format they appear on the ships. Staff will also be on hand to chat through the cruise line’s dedicated wine harvest cruises sailing in the Mediterranean hosted by wine expert Oz Clarke. Sommelier master-classes with top vintages will be included in the samples on offer for wine lovers to whet their appetite for the holiday on the high seas. There will even be an opportunity to win a place on a wine cruise in October hosted by TV’s Oz Clarke. Tickets to Taste of London, which takes place from today until Sunday, cost from £25.80 (including booking fee) and allow access to food from more than 40 top UK restaurants. Ready to join the Cookery Club? Will Fred Olsen’s extra-charge Grill restaurant turn out to be a mis-steak?